Urban Sketchers Seattle: What a Difference! What a difference another park & ride makes! Normally on a weekday at Tukwila Light Rail station's park & ride there are no parking spots if I'm not there between 0700-0730. About a month ago the new Angle Lake station opened to the south of Sea Tac, making it the furthest south. It includes 1,120 park-and-ride spaces. Today I tested the effect of those additional spaces. And. Wow! At 0830, there were still more than a couple dozen spots at Tukwila! Even when I returned at 0930, there were still nearly that many! This will shorten my commute into Seattle for sketch outings and other activities as I won't have to park further away and take a bus. 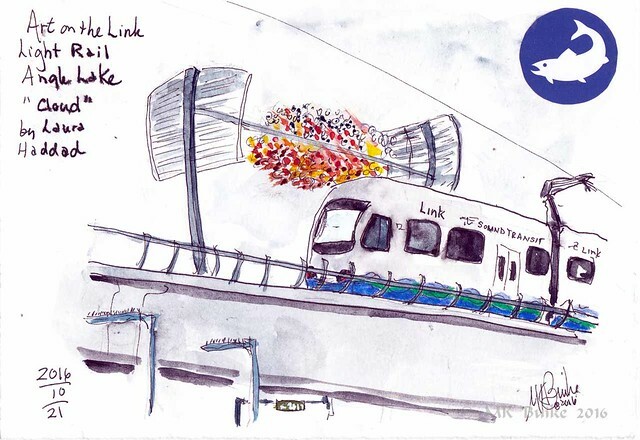 I rode down to Angle Lake to add another sketch in my series on the art at the light rail stations. As I approached, I could see the massive multi story parking structure to the west of the tracks. And I could see a few empty spaces there, too. 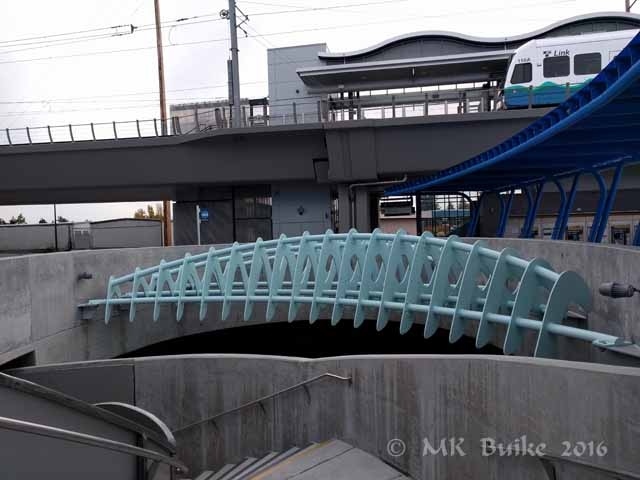 Each light rail station has at least one, and usually more, pieces of art installed. I'm slowly working on a series to sketch them all. The pictogram in the upper right corner is a bit of collage collected from the Metro website. Each station has it's own pictogram and I will be including them as I complete more sketches. From the wiki: "Laura Haddad's 'Cloud' is the station's most prominent feature and is suspended over the elevated platform as it crosses South 200th Street. The 48-foot-long (15 m), 26-foot-high (7.9 m) sculpture consists of 6,000 small colored acrylic disks that reflect sunlight in ways dependent on variations in light, weather or an approaching train; at night, the disks are illuminated with LED floodlights that fade from orange to blue as trains approach the station. Haddid describes her sculpture as a "community landmark" and "sculptural barometer of local weather"
I didn't sketch the other art: "Jill Anholt's 'Immerse' is embedded in the plaza's grand staircase and consists of four "delicate arcs" made of curved steel and tubing that connect the garage and station. Anholt's piece uses the arcs to filter light onto the parking area and 'celebrates the process of falling rain'"